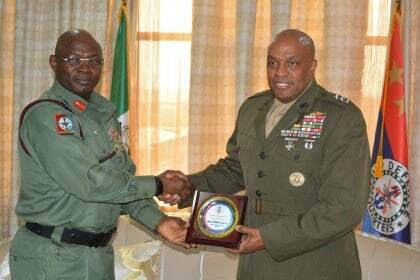 The United State Director of Defence Intelligence Agency Lt Gen Vincent Steward has commended the resilience of the Nigerian Armed Force for defeating Boko Haram and chasing them out of their once safe haven Sambisa forest. Lt Gen Stewart made this remark when he visited the Nigeria Chief of Defence Staff General Gabriel Olonisakin at the Defence Headquarters Abuja. The US Director of Defence Intelligence Agency stated that he was in Nigeria to meet with the top echelon of the Nigeria Armed Force with a view to collaborating in the areas of security and to pledge more support for the military in order to engender total stoppage of Boko Haram from operating in Nigeria territory and denying them future freedom of operation. In his response the CDS General Gabriel Abayomi Olonisakin appreciated the cordial working relationship between the US and Nigeria, especially in military cooperation. 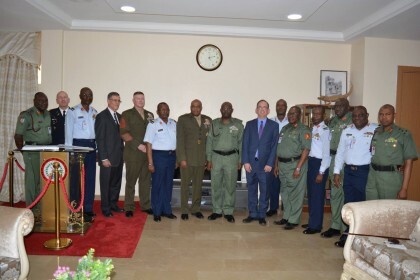 He thanked the United State for all the supports the Nigerian Military has enjoyed from them, saying the gesture has contributed immensely to the success recorded against insurgency. General Olonisakin used the occasion to intimate the visiting US Senior Officer that the Nigerian Armed Forces always uphold the tenet of Human Right and dignity in its operations. 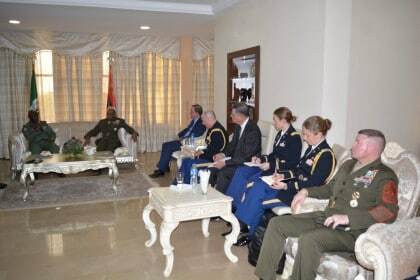 He told the US Security Chiefs that presently Nigerian Armed Forces has established Human Rights Desks in all its units and formations to safeguard Human Right of Individual including the belligerents.